On Wednesday evening, 06/13/2012, at 6:53 PM the Spokane Fire Department responded to 4101 E Fredrick on a reported structure fire. The first crew on scene was Engine 2 from the Logan Neighborhood, who was returning from a Marine Rescue call on the Spokane River and stopped to investigate a smoke odor they detected. The Engine 2 crew had no Fire Officer on the Apparatus due to splitting crews for the previous rescue call. They discovered a room and contents fire on the back side of the single family residence. They ensured the resident was evacuated, turned in a full structure fire response, and extended pre-connected hose lines to prep the scene for an offensive interior fire attack, once backup arrived. Later arriving company's established a water supply, removed security bars from windows so they could be used for ventilation, and stretched more hose lines to provide back-up for initial crews. The incident was mitigated within 1 hour and there were no reported injuries to civilians or fire fighters. Six fire companies with 20 firefighters were dispatched to this incident. The cause of the fire was smoking related. The fire was confined to the bedroom of origin and with the exception of some water and smoke; damage to the structure was minimal. 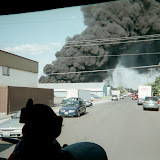 On June 14, 2012 the Spokane Fire Department responded to a reported structure fire in an apartment complex at 7022 N Colton Street. On scene personnel up graded the first alarm response to a second alarm response. The fire was up graded again to a third alarm by an arriving Battalion Chief. Twelve fire apparatus and seven command staff were on scene to battle this blaze. The fire was contained to five apartment units, with damage to two others. The attached apartment units to the North suffered minor damage. Fire crews were on scene through out the night. There were no injuries to residents, citizens, or firefighters on this fire scene. Fire loss to five apartment units, minor damage to two others units.